Homes and Frost Heave - March 2015. Cochren Foundation & Repairs have been dealing with homes that have water as well as structural issues, including bowed basement walls and house settlement. In the last two years they have been faced with a new challenge, dealing with homes that a going in the other direction – upwards due to frost. In just 5 days they have seen 13 homes that have sustained damage from frost ranging from minor to severe. We have all seen the effects of frost, a crocked fence post, leaning pillars, a bumpy highway, crooked signs and uneven sidewalks in southern Ontario. 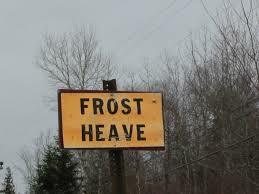 However, only in the last two years we are seeing homes lifting up due to a phenomenon called frost adhesion. Ice lenses form in porous soil and then grow by attracting ground water to them. The movement of water is key to the lens growth and can lead to volume increases well in excess of 9%, the normal volume increase when water changes into a solid. In our area, footings are buried 4'-0"feet in the ground to prevent frost from going underneath and lifting the home. 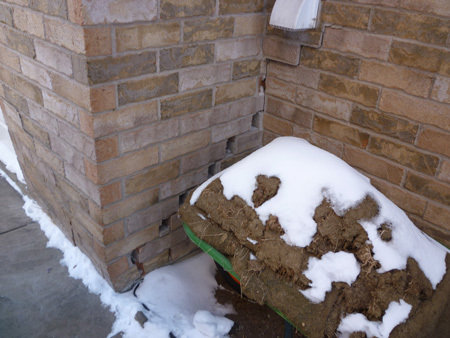 With Frost Adhesion, the ice actually attaches itself to the side of the foundation wall forming a bond strong enough to lift the home upwards. Frost adhesion seems to only effect lightweight, unheated structures such as cold cellars or garages with shallow foundations. Buildings with previously cracked foundation walls from settlement are particularly vulnerable. The sudden occurrence of a crack is usually accompanied by a large bang being heard if you happen to be there at the precious moment. Plain, unreinforced concrete is very brittle, when the ultimate strength of the material is exceeded, it cracks suddenly, without any warning much like when the ice over a frozen lake cracks. 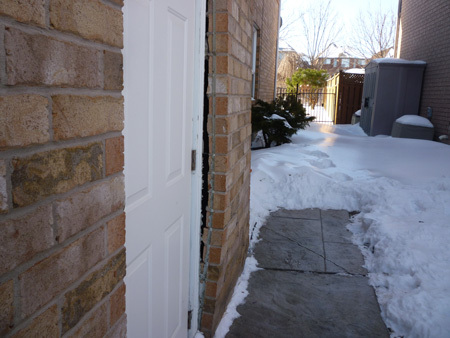 Distortion is caused by unequal lifting around the garage or cold cellar, causing doors and windows to become inoperable, a 2" difference across the top of a door way is not uncommon. Large step cracks occur in the brick veneer and concrete floors typically heave and crack. With luck, the foundation should settle back down with the spring thaw. However, if soil falls into the cracks that formed in the foundation wall by frost adhesion, then the building cannot settle back to its original position, creating a big problem for repair. If the home has moved this year or last year from frost adhesion, then it will move again when we experience prolonged cold winters, for this reason it should be dealt as soon as possible. Removing the frost susceptible soil. Insulated to prevent frost penetration. No two homes are the same! Finding a guaranteed, cost effective solution creates a new challenge for each and every case. The investigation, must not rule out the foundation had been previously damaged by house settlement. For this reason, initially each case should be treated as both settlement and frost adhesion. John Cochren P.Eng CPM Pres. The effects of Frost Adhesion on homes.